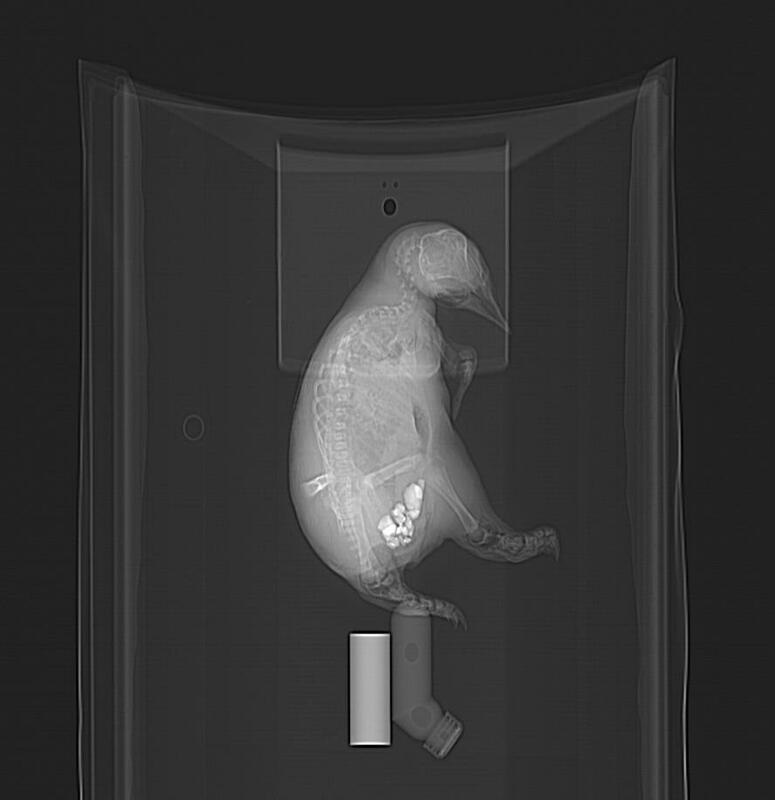 The Existentialist Penguin | What's In John's Freezer? It’s World Penguin Day! Watch your back though… these penguins aren’t as nice as they seem. But they need us to be nice to them! Whether you watch a classic GIF like the one above, or a kid-friendly TV/film documentary, you might get the impression that penguins lead carefree, or at least silly or slapstick, lives– happy feet and all that. It works for Hollywood: a Charlie Chaplin comedy relief role to play. And that’s the vision of penguins I grew up with: they were living cartoons to me. Stomach-Churning Rating: 5/10; some tears may be shed over cute baby penguins and you might choke if you’re a rhea trying to swallow one, but the anatomy shown is mostly skeletal or dessicated. No penguin juices. Except those just mentioned above. I’m quick to admit, I didn’t know much about penguins until recently. I couldn’t name many species or say much about their behaviour, anatomy or evolutionary history. When I was a graduate student at Berkeley, I was enthused by a now-classic, elegantly simple study (published in 2000) that fellow PhD student Tim Griffin and biomechanist Dr. Rodger Kram conducted on penguin waddling. They found that the waddling gait of penguins isn’t mechanically disadvantageous, as it appears, but rather is a way that they conserve energy while walking. It’s the short legs, instead, that make their gait metabolically expensive, because shorter legs mean that more frequent, costly steps need to be taken, incurring high costs due to rapid firing of leg muscles to support the body. My vicarious enjoyment of Griffin’s & Kram’s research began my scientific introduction to penguins. Fast forward to 2014: I get a crash course in penguinology. That’s what this post is about, and how it brought me in touch with The Existentialist Penguin— the haggard, storm-tossed, predator-harried, starved and bullied wanderer of wastelands. My personal introduction to penguins over the past year has been initiated by a collaboration with PhD student James Proffitt and long-time colleague Dr. Julia Clarke, both at the University of Texas in Austin. They kindly invited me to collaborate on applying modern biomechanics to the surprisingly excellent fossil record of penguins (Sphenisciformes), among other extant water birds. Before diving into it all, I happened to go to Argentina. Penguin tries to keep cool in the shade, opening its mouth to shed heat in the autumn sun. 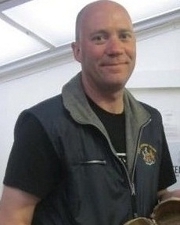 Just before I travelled to Patagonia on unrelated business (to study sauropodomorph dinosaurs! ), I did a little googling and came across Punta Tombo reserve, near the city of Trelew that I was visiting (more about that in a future post!). It’s where some 1+ million Magellanic penguins (Spheniscus magellanicus) gather every southern summer to breed and fledge before making a long ~5 month swim up to Brazil. I asked my host, Dr. Alejandro Otero, if we might take a day off to visit this spot, where guanacos, rheas and other wildlife were also said to be common, and he basically said “Hell yes!” as he’d never been there. My Flickr photostream gives a big set of my favourite photos from that trip, but here are some others below, to show some of my experiences. We rented a car and took a lovely 90-minute drive south across the Patagonian plains, observing wildlife like tinamous (yes! So exciting for me) as we went. You could get within 1.5m of the penguins according to park rules, and the penguins were very permissive of that! The video below shows a penguin encounter that left me with no doubts that these animals don’t mess around. The smaller penguin escaped, losing its cool burrow and some of its tough hide, too. Indeed, penguins can be remarkable assholes to each other. Near the end of our visit, just after I saw an informative sign about the lesser rhea or “choique” (Pterocnemia/Rhea pennata), we managed to get very close to a rhea and follow it for a while, as penguins stood around in apparent disinterest. I’ll never forget that meeting: two flightless birds, yet adapted to such different lifestyles and habitats. 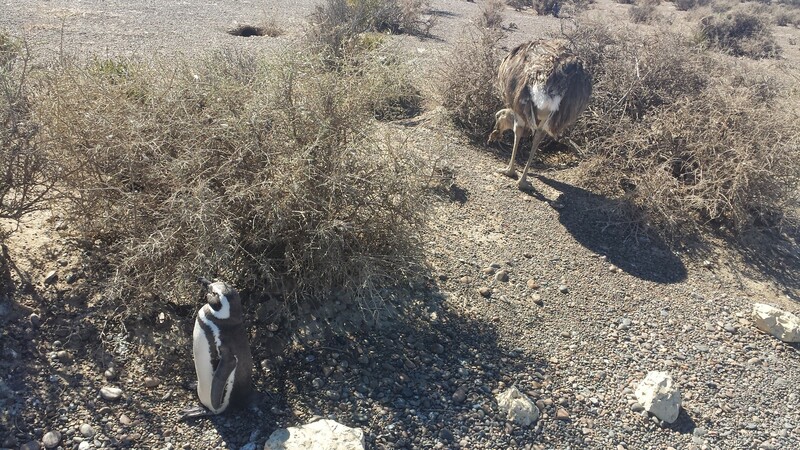 The penguins were in the rhea’s domain; a hot, wind-blown, scree-scoured scrubland on the edge of the fertile ocean. My first encounter with a penguin in the wild (but not a live one) is probably this specimen washed up on a beach in Uruguay. 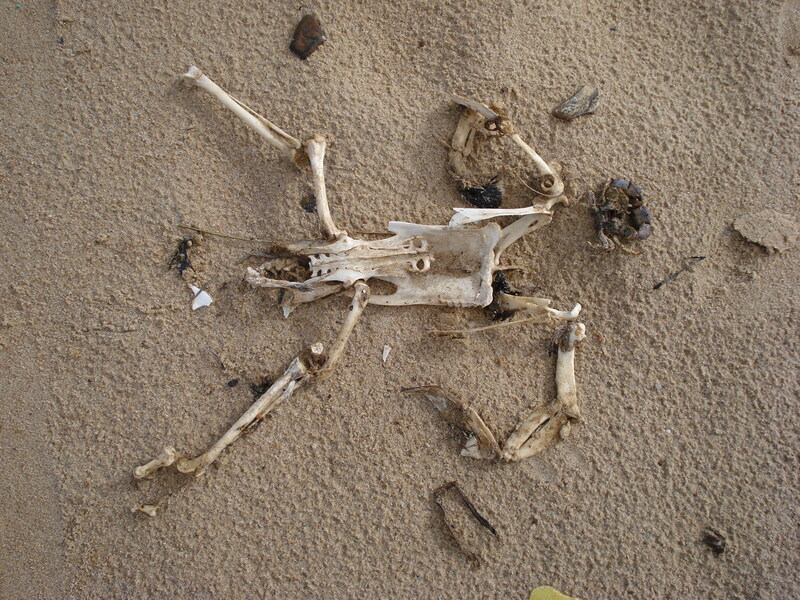 I’m going with the tentative ID of a juvenile penguin skeleton (short foot; flat wing bones); probably Magellanic. The bevy of vertebrate morphologists investigating dead penguins on this beach during our conference in 2010 will not soon be forgotten! 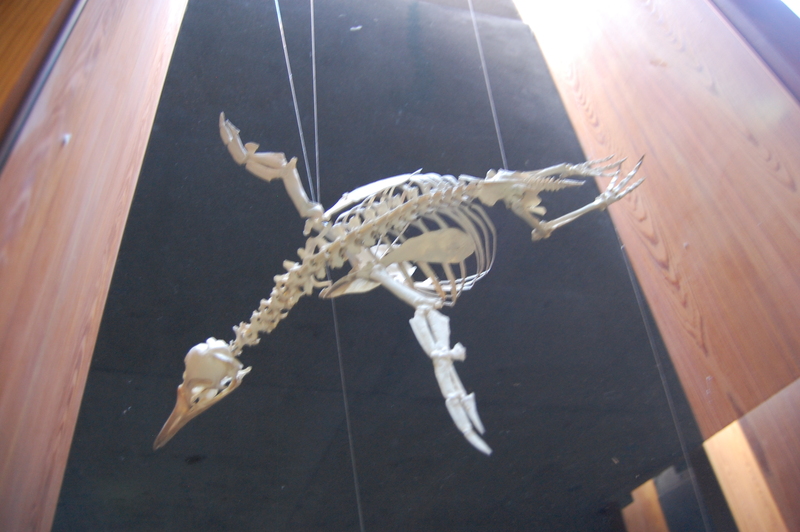 Magellanic penguin skeleton, “flying” through the Punta Tombo visitor centre. University Museum of Zoology Cambridge skeleton of a “great penguin” (do not confuse with the great pumpkin!) species of Aptenodytes; either King (patagonicus) or Emperor (forsteri). Characteristic features, in addition to the robust, dense skeleton, include the short neck, flattened but robust wings and scapulae, robust furcula (wishbone), stubby legs (with a big blocky patella) and thin but longish tail (supposedly used to balance with while walking/standing). 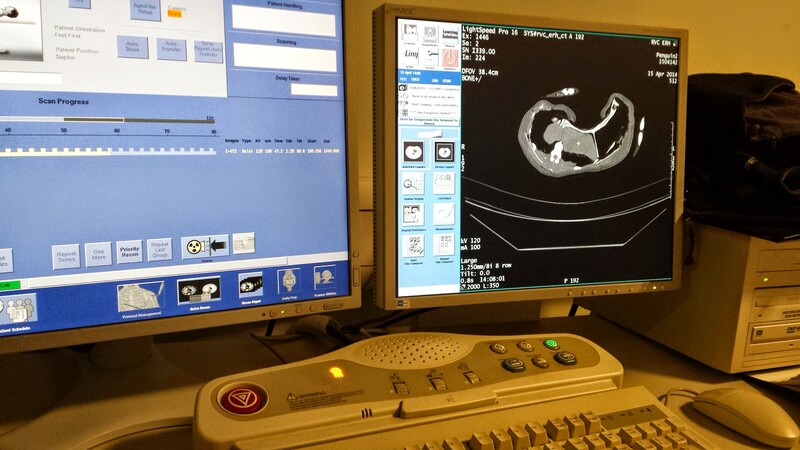 CT scanner monitors as I scan a penguin; mid-torso x-ray slice shown on the right. 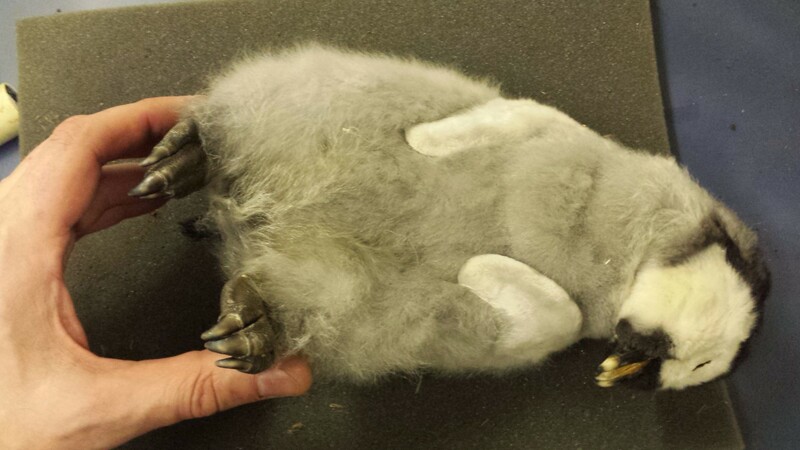 Awwwwww… baby Gentoo penguin (Pygoscelis papua— EDIT: Probably Aptenodytes; see comments below). 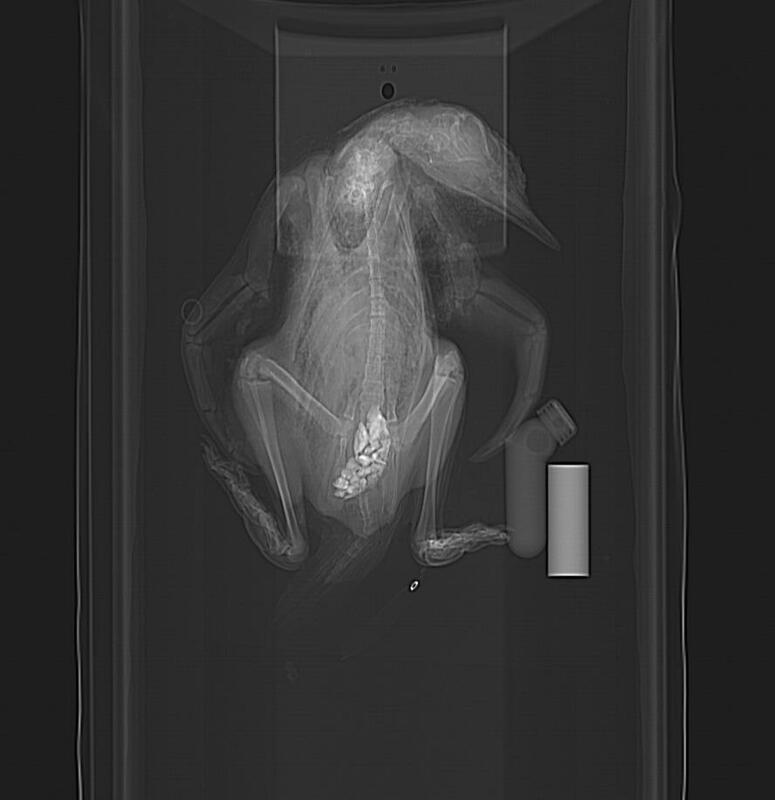 Unhappy feet, I’m afraid… Happy CT scanning, however– specimens like this are NOT easy to come by in these northern nether regions! Calling all penguin experts! What’s up with this? Is that really how much gastrolith (stomach stone; near bottom of image) volume a penguin carries (answer after some literature reading: maybe yes! 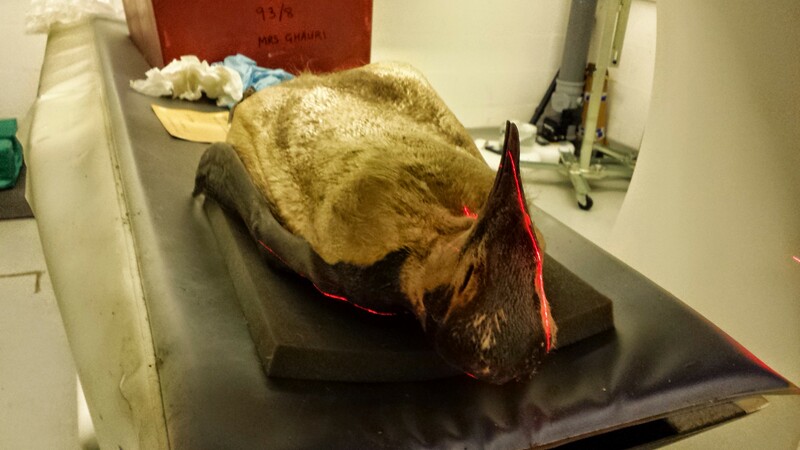 ), or did a museum curator stick rocks up its bum? It seems very caudal in position, and this is consistent with other animals I’ve seen (some below). A paper on this phenomenon and potential role in ballast is here. Another here. Side view. Nice view of the head at least. Young juvenile. Nice pose, and lots of anatomy is shown. And check it out- gastroliths?!? In such a young animal– is it even feeding yet? (presumably straight after hatching) And they are relatively big pebbles, too! 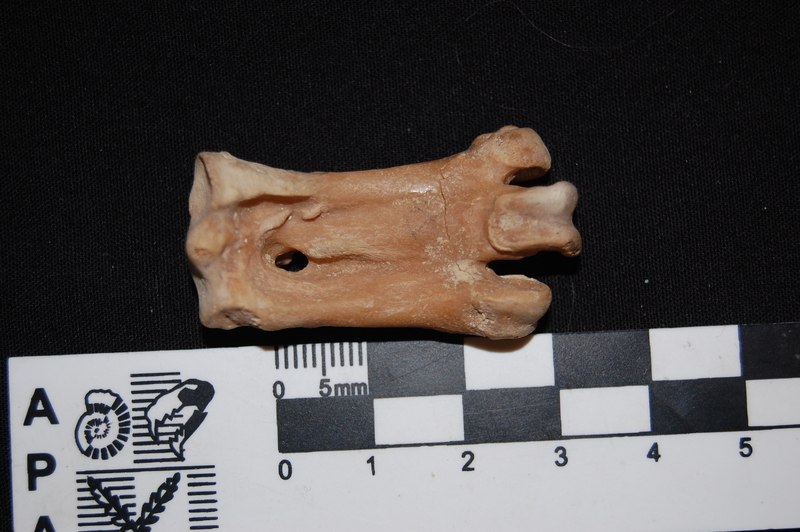 If I noticed this 5 years ago, it would have been a nice paper to report- first recognition of gastroliths in penguin chicks seems to have been then. Indeed, that study observed some chicks intentionally swallowing stones. Another youngun; the fluffy one from the photo above. More rocks up its wazoo. Three wee little chicks, all with stomach stones. 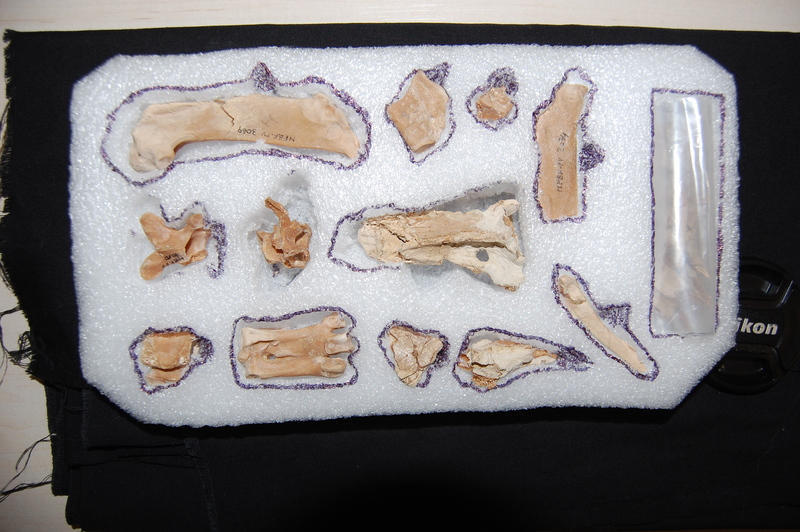 Part of the nice skeleton of Palaeospheniscus patagonicus, an Oligocene/Miocene largish penguin; from the MEF collections in Trelew, Argentina and collected nearby. The genus has been known since Ameghino’s description in 1891, and is closely related to living penguins, especially Aptenodytes. It was not a large penguin, but at about 5kg body mass was no slouch as birds go (roughly similar in size to a Magellanic penguin). I also got to see Madrynornis mirandus, a Miocene form. 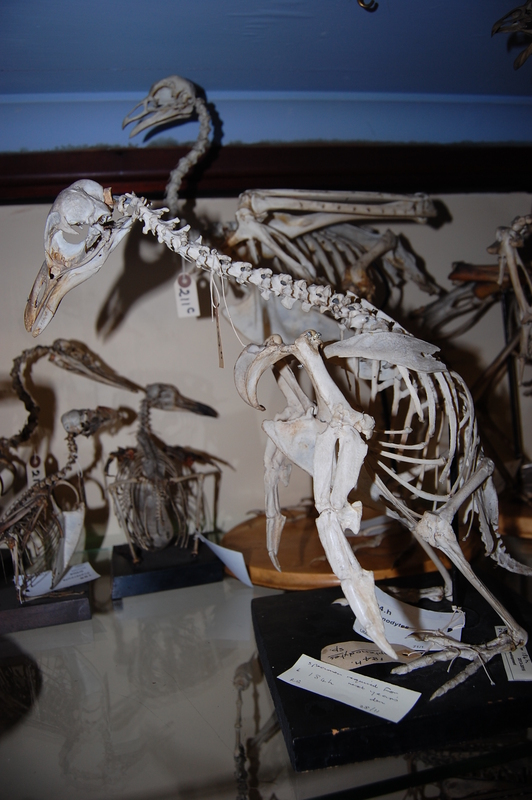 For me, the diagnostic trait of a penguin skeleton: the very short, tobust tarsometatarsus. From Palaeospheniscus, as above. The great palaeontologist GG Simpson wrote of it: “Despite the innumerable variations in details, the tarsometatarsi, on which all species but P. robustus are based, are quite stereotyped in general structure and leave little doubt that the forms placed here by Ameghino do all belong to a natural group.” A ratio of length to proximal width of >2 is typical of most penguins. Synapomorphy FTW! From beach skeletons, to mass suffering of landbound birds, to 3D imaging and fossil skeletons, I’ve had quite the immersion in penguinness lately. And through that experience, I’ve been drawn closer to penguins in more ways than one. I’ve been impressed by their adaptability and durability. In some ways, penguins’ adaptations to harsh freezing winters in wastelands also aid them to survive harsh baking summers in dry badlands. Yes, those badlands are still coastal, and penguins can still drink the saltwater and excrete salt via their supraorbital glands, but those penguins in Punta Tombo were not having a keg party. They were clearly enduring some serious discomfort, and not all making it through the ordeal. I watched silently along with other penguins as one penguin lay prone in an awkward pose on a bleached-white stretch of hardpan soil, while one flipper meekly raised, then flopped down. It was not long for this world, and there was a host of large scavengers around ready to make the most of that, while penguin-eating giant petrels (a sister group to penguins) wheeled overhead. While penguins still spend most of their lives at sea, they retain a sometimes astonishing array of behaviours they use on land: burrowing, hopping/jumping, costly short-legged (but efficiently waddling) walking, and perhaps more that we haven’t yet discovered! Their unique anatomy reflects a compromise between all these factors, and we’re fortunate to have knowledge of their fossil record that shows a lot of detail on how they evolved it all. While penguins are a highly aquatic species, they show how aquatic and terrestrial adaptations can coexist in harmony; it’s not just a black-or-white issue. But with climate change in progress, the ~18 species of penguins have some rapidly altering challenges to adapt to, or go the way of Waimanu. This is a critical Kierkegaardian moment for The Existentialist Penguin. I raise a glass in toast to that versatile, resilient, gravel-gizzarded Existentialist Penguin! May it persevere all the troubles our ever-changing world throws at it, as it has done since the Palaeocene. And may we draw inspiration from its tenacity, to face our own troubles, together on this crazy spinning globe! Very neat, I especially enjoyed the ‘rhea eats penguin’! The chick featured above as a Gentoo chick is, I think, actually an Aptenodytes (most likely an Emperor). Thanks! The rhea encounter was surrheal! Ahh yes, I took the NHM’s dodgy label at face value. It did look familiar, and I didn’t know Gentoos but now that I google some images, it does look more like Aptenodytes. Will edit text. Penguins are pretty weird creatures, in both anatomy and behaviour. I had the chance to work with fossil penguins while I was living in Buenos Aires, and if the small Magellanic penguin has such a bad mood, his ancestors 2 meters tall … well, luckily they’re extinct! Great post John! Recently there was a great documentary on called “Waddle all the Way” on Discovery (not sure if it aired in the UK) that recorded some very interesting behaviors, such as Rockhoppers in the Falklands using their forelimbs to help climb steep rocky slopes. Of course sometimes they would slip and roll 10 meters back down the cliff to the bottom, only to get up and try again. As you say, they really do have grit, or lack of good sense, I’m still divided on which. Thanks for the tip, I’d love to see that documentary- I’m keen to see some shows about non-Antarctic penguins! You guys have those ways to estimate weights and centers from volumes (Allen 2013)… you could use the models to do some penguin submarine naval architecture, guess where the center of buoyancy and center of mass are relative to one another and the wings, and how heavy or light overall the penguin is (freeing wings to be mostly propulsors), and what their trim is like? Doesn’t look like (Taylor, 1993) did this – maybe repeat for others too? Should go to Antarctica… to get field data. Definitely. Amazing place. Excellent journey. Think about where to go next time, John! Coming from New Zealand where we do have penguins, I’ve always been inclined to think of them as noisy little arseholes. I agree you’ve really got to admire how tough they are. I’ve even heard of the little blue ones nesting under people’s houses. 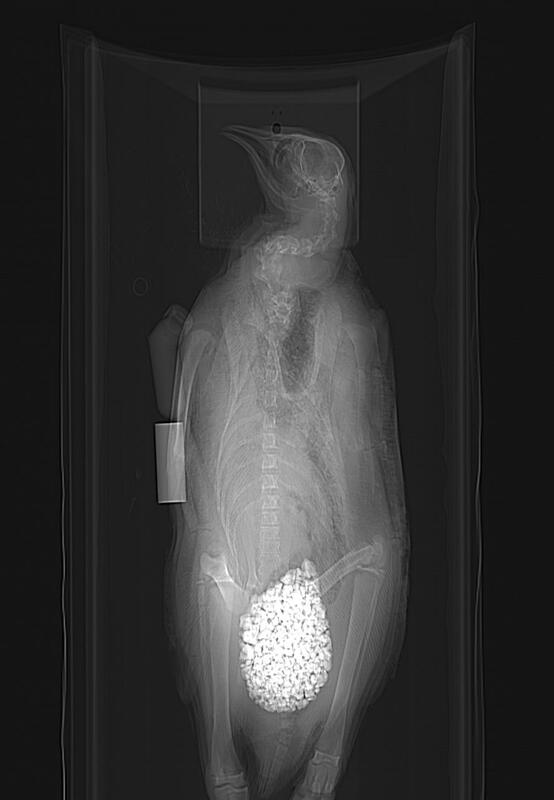 I had no idea penguins use gastroliths, and I’d love to know how that affects their swimming. 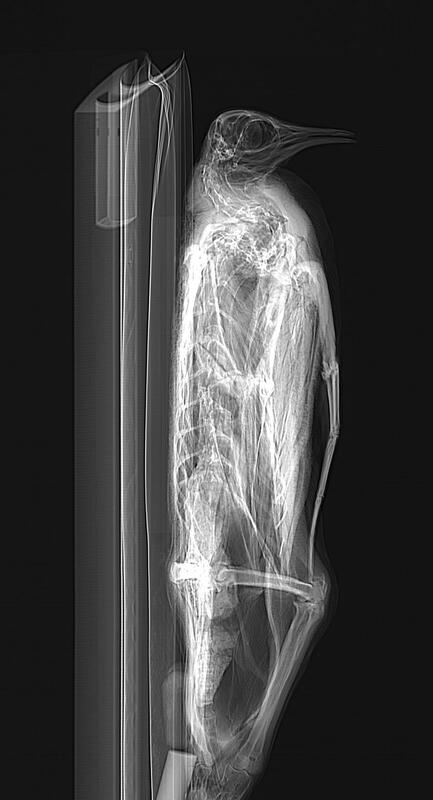 I suspect the elbow thingy is what’s often called an “ulnar patella” or similar, which evolves sporadically in a few birds but is barely studied. The carpal-y thing seems to be a similar sesamoid bone. I’ve read even less about that, generally in birds. Plenty left to study! I checked my great auk pics and don’t see anything similar. I don’t know other sea-birds enough to comment in an informed fashion– maybe someone else does?